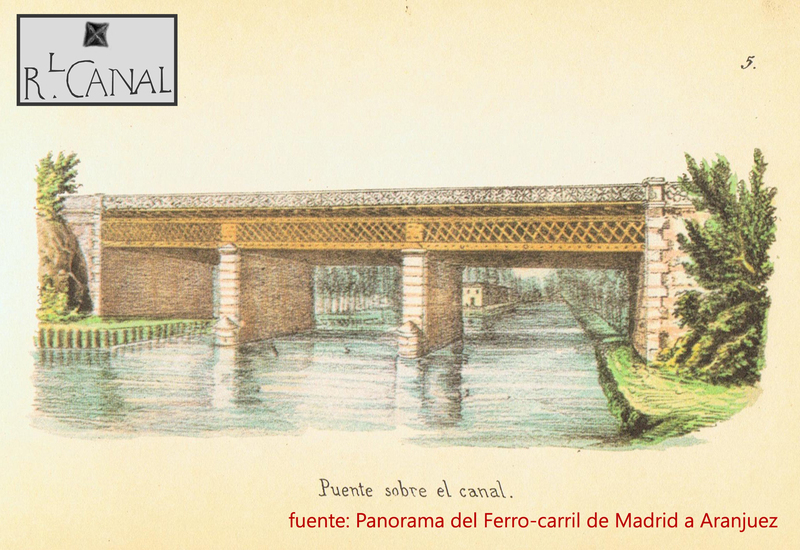 The Railway Bridge over the Manzanares Canal was situated some meters before the Third Lock, where the Super South Junction of the M-40 road stands today. It was 5 km abroad from the Headwaters, and it could be not considered as a part of the Canal infrastructures. It is not a part of the hydraulic system, or even part of the project, but is indeed an element related with the ways crossing the Canal: we should see it as one bridge more. It was built after the Canal works definitely stopped, and just done to cross over the Canal, and still more it was built for the main enemy of the Canal: the railway. This new technology, more efficient, cheaper and faster than the water transports was called to be the future, instead of the Canal, which was already obsolete in comparison. The bridge was built around 1847, for the new line to Aranjuez, at least opened 5 years later. It consisted of a timber latticework beam over two perpendicular load-bearing walls and two solid supports in the extremes all of them made on brick and limestone. This element is not further known, despite the line is still working nowadays. It could be destroyed after the Canal enclosure, or just it could stay in its place under the earth. In any case, some rests could be surely found if in the future an archeological search is done. As continuation of this bridge was another over the river, from which the supports are conserved still today.